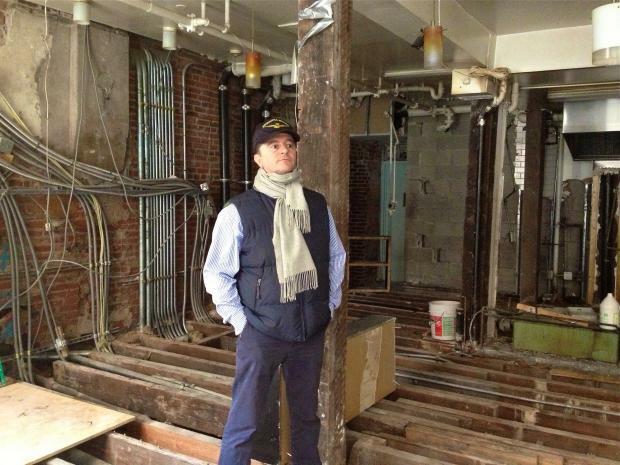 SOUTH STREET SEAPORT — Like many residents and business owners in South Street Seaport, Claudio Marini, owner of Italian eatery and grocery Barbarini, was devastated when he first saw the massive damage wrought by Hurricane Sandy’s floodwaters. And more than a month after the Hurricane, Marini and his wife, Linda, say they still feel overwhelmed by the destruction. Their restaurant, on a historic slice of Front Street that lies between Peck Slip and Beekman Street, remains shuttered — most of their neighbors on the block, who are owned by the same landlord, a group called Yarrow LLC that's run by the Durst Corporation and Zuberry Associates, also remain shuttered. Only two spots, Made Fresh Daily and Jeremy's Ale House, are open on the street. Because of the extensive damage to the buildings, especially the electrical system, the landlord has said the properties won’t be up and running for at least six months, Marini and other local owners said. Last week, as their property continues to be renovated, the Marinis launched a funding website to help raise money for a new restaurant they've decided to call Da Claudio. Funding sites for hurricane-wrecked restaurants and business are gaining popularity as owners continue to struggle to rebuild. Some grants have been made available, and there are loan options — but many residents say it isn’t enough, especially since many lacked flood insurance. The Marinis aren’t set on an exact location yet, but it will likely open in the Financial District. They also aren’t giving up on Barbarini. “We love lower Manhattan. We want to stay here,” said Linda Marini, who lives nearby on Murray Street. The couple opened Barbarini in 2005 with a co-owner and watched the neighborhood grow and rejuvenate over the past several years, she said. In 2009, they expanded their popular grocery and café with a larger restaurant — financing everything themselves and spending nearly $1 million over the years. The Marini’s, who also own Midtown’s Caffe Linda, said they are trying to join with other Front Street business owners devastated by the storm and create an association called United Front. But she also said she’s extremely thankful for the outpouring of help she and her husband have received from neighbors. Nearby, New Amsterdam Market has offered them a spot in the market to sell whatever goods — olive oils, wines — they were able to salvage from the storm. To date, the couple have raised more than $11,000 toward building Da Claudio.